Arrive in Nairobi and transfer to your boutique safari retreat, ideally posed on the edge of Nairobi National Park. The next day, enjoy a leisurely morning and a restorative yoga class before departing for an afternoon of inspiring encounters. Begin with a visit to the 15-acre Giraffe Centre, also a conservation education centre for local schoolchildren, where you hand-feed endangered Rothschild’s giraffes. Next, spend time at the innovative Ocean Sole workshop to see how recycled flip-flops are transformed into incredible works of art. Pay a special late afternoon visit to the Daphne Sheldrick Elephant Orphanage to observe these intelligent creatures, and learn about the program’s success in raising and reintegrating over 150 elephant calves into the herds of Tsavo. Tonight, gather for a welcome dinner. Rise this morning for a game drive in the spellbinding Masai Mara, or choose instead to float far above the bustle of the plains on an optional hot air balloon flight (for an additional cost and weather permitting), experiencing the Mara at its most peaceful before touching down for a Champagne breakfast in the bush. Back at your lodge, enjoy time at leisure or indulge in your included spa treatment, choosing from three rejuvenating treatment options. Later, visit with a member of the local Maasai, who discusses the tribe’s culture and the importance of jewellery before leading a beading demonstration. An afternoon game drive across open savanna and woodlands is followed by a freshly prepared dinner. Begin your day with an energizing sunrise yoga and meditation session. 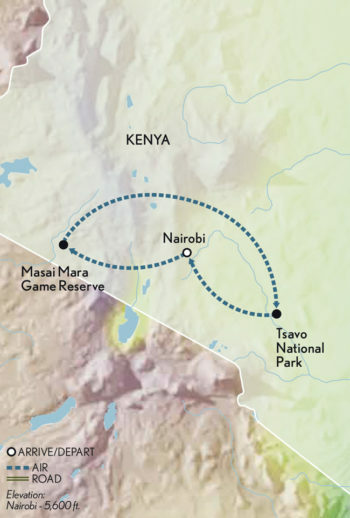 The gentle mountain range that rises under the verdant Chyulu Hills boasts volcanic tubes and dense cloud forests. After breakfast, set off on a game drive through this landscape, and then explore the forests on a guided hike that crisscrosses animal trails. Return to camp for an afternoon at leisure, during which you may enjoy your tented camp’s luxurious wellness facilities, including a relaxing hammam, modern fitness centre and outdoor infinity pool. As the late afternoon sun begins to set, depart for a final game drive in Tsavo West National Park, taking in deep breaths of its greenery, rocky peaks, natural springs and rolling hills. Tonight, gather with fellow guests to celebrate your Kenyan safari with a special farewell dinner.